A series of sniper attacks near Lupin let him know that he’s being summoned to a chess match by an old man who wants him dead. The location is in a rocky, desert ruin. 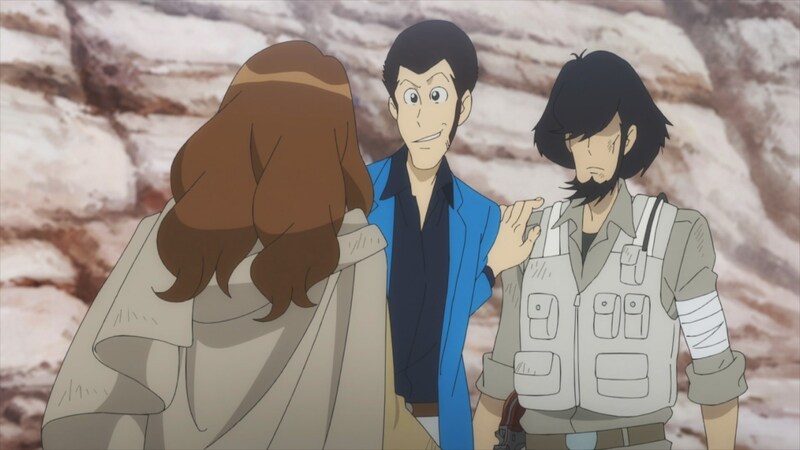 Lupin gets Jigen to watch his back as they come to understand the sniper is a woman named Mirage, whom Jigen had worked with in the past. 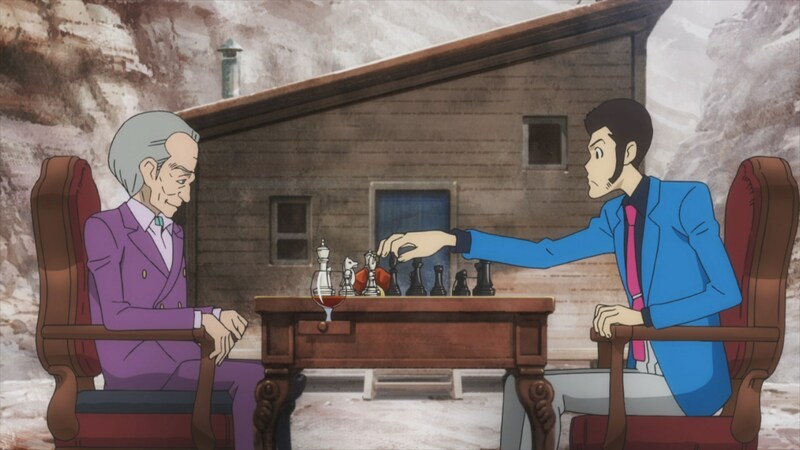 While Lupin and the old man play chess, Jigen and Mirage engage in a lengthy sniper battle. Mirage gets the upper hand on Jigen, thanks to a drone that Jigen eventually shoots. Jigen takes a hit in the arm and recalls when he and Mirage parted company. The battle between the two intensifies. Eventually, Mirage shoots out part of the ruin where Jigen is in. She thinks she has him buried and turns to assassinate Lupin. 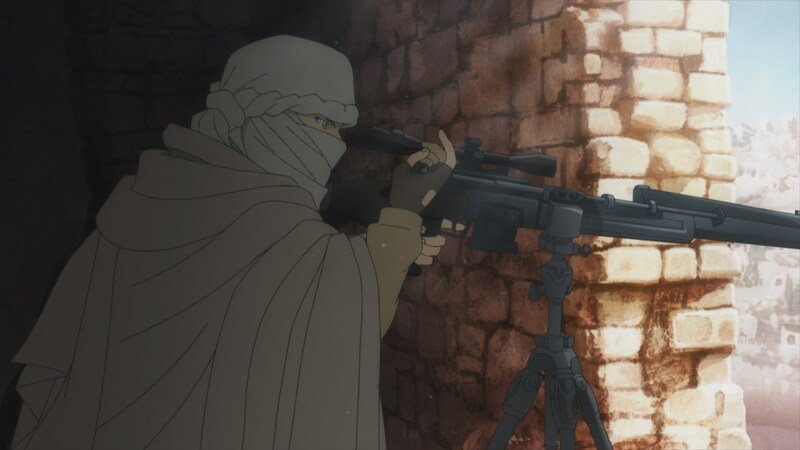 However, Jigen shots her rifle, causing her shot to miss. A ricochet bullet hits the old man in the leg and he passes out after Lupin loses the chess match. The enemy sniper is revealed to be the daughter of Mirage. She needs the money to help her mom. As such, Lupin tells her the €1 million jackpot is hers. I see that a lot of people loved Lupin the Third Part 5 – 19. For me, it was just something to kill time. I don’t know if the old man in this episode was in an earlier Lupin series or not. I kinda doubt it. However, they apparently have some big past and have had games before. The old man wants Lupin dead, so why bother with the chess game for €1 million? Mirage was going to kill Lupin, game be damned. So it all seems stupid to me. And then there’s the location. 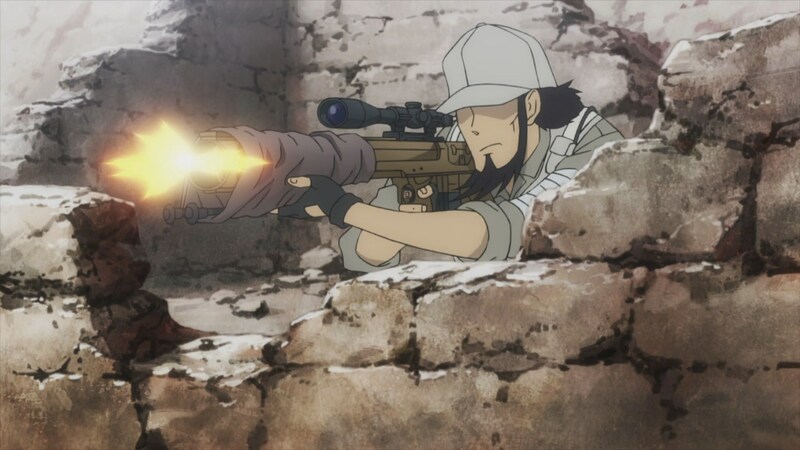 I guess the old man wanted a sniper battle, figuring Lupin would bring Jigen. As such, we are in the middle of a rocky desert with massive ruins in the giant rocky area on either side where Lupin and the old man play chess. It provides atmosphere for sure. Frankly, the sniper battle bored me. That’s not to say it wasn’t well done. On one hand, I was reminded of my sniper builds in the Fallout franchise. I’ve always enjoyed sniper builds in the game ’cause one gets to sneak and take out enemies from afar. On the other, I was reminded of the movie American Sniper. One of the plot elements in that movie is an enemy sniper out to kill American sniper Chris Kyle. At least in American Sniper, there was a point to it all–saving American lives. 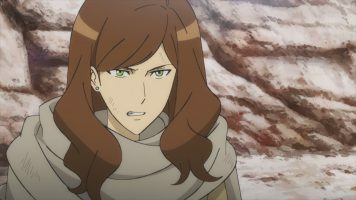 But in Lupin the Third Part 5 – 19, the stakes just aren’t that high to me. As such, I didn’t really care, more so because I already know Jigen was going to win. 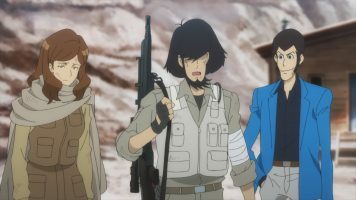 I really don’t have a lot to say about Lupin the Third Part 5 – 19, so I’ll wrap up my review of the episode. No Goemon, Zenigata, or Fujiko appearances in this episode. 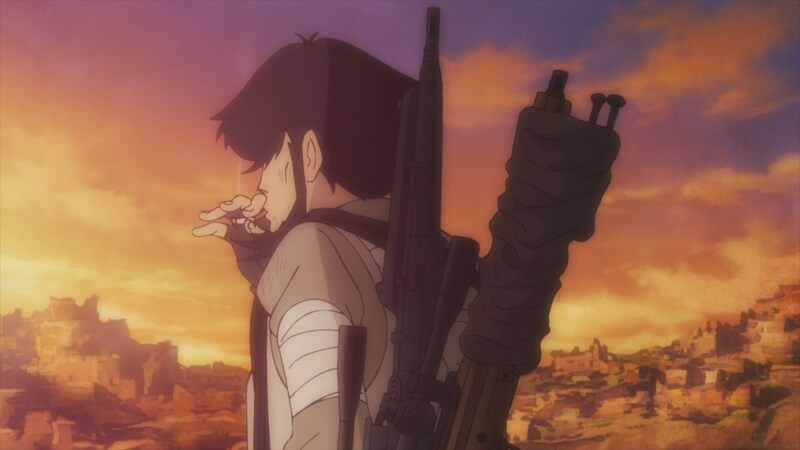 Giving Jigen a “past” with Mirage was supposed to evoke some emotional feeling. However, it just felt cliched. When the sniper was revealed to be Mirage’s daughter, I was relieved that the writers didn’t make Jigen her father. 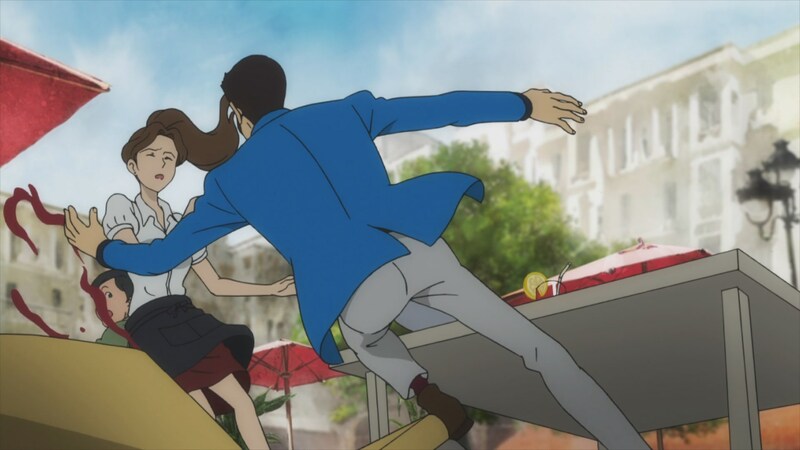 In the end, Lupin the Third Part 5 – 19 is OK for what it is. However, it is a very forgettable episode. I’m kinda bummed that the last leg of this series has gone full episodic, or so it seems. The old man was an original creation and he’s apparently Mamo redux sans the tragic characterization. He didn’t seem compelled to kill Lupin. I think he simply wanted to include a sniper during their chess game for shits and giggles. The episode is fairly routine but enjoyable in my estimation. I think the duel between Jigen and the sniper would have been more interesting if the former would have had to overcome some disadvantage. He didn’t seem compelled to kill Lupin. I think he simply wanted to include a sniper during their chess game for shits and giggles. Except that if Jigen hadn’t won, Lupin would have been dead. ? That was part of the game. I am sure the old man knew Lupin’s partner was Jigen. I wonder what Mirage’s daughter’s real name is. I have an account on http://www.fanfiction.net and would like to include her in some of my upcoming stories. Also, it’s nice to see Jigen without his hat. In the present day his hair covers his eyes, though he still manages to see. And, in the past, his eyes are visible to us and there like how they were in the red jacket series and the pink jacket series. 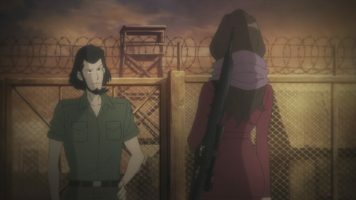 Too bad Jigen wasn’t girl’s father, that would have been a good twist to this episode’s story. P.S. there is a fanfiction story on this episode on Archives of our own with the paring of Lupin x Zenigata, and I recommend that story to you. I just had a far out theory regarding Zenigata’s relationship with Lupin in The Mystery of Mamo. Zenigata was obsessed with putting an end to Lupin’s life in the film. Maybe it was because he could not deal with the fact he was sexually attracted to Lupin. He saw Lupin as the son he never had and possibly a lover. I don’t know about that. The franchise has always shown Zenigata to be attracted to women when that has come up. At the end of the day, Lupin is the ultimate challenge for Zenigata and vice versa. I believe there have been a couple of times where Zenigata nabs Lupin, but then becomes depressed because the “game” is over. When Lupin ultimately comes back to life or escapes, Zenigata’s purpose in life is restored. I was only speaking of Mamo but I admit it’s just a theory. There was also a less than subtle hint that Lupin was attracted to Zenigata. That peak into Lupin’s subconscious revealed that he may have have played for both teams ! LOL ! Ah. Well, it has been way too long since I watched that, so I really can’t comment there. ? I know you’re not exactly in love with that film. For me, The Mystery of Mamo is the best of the series.